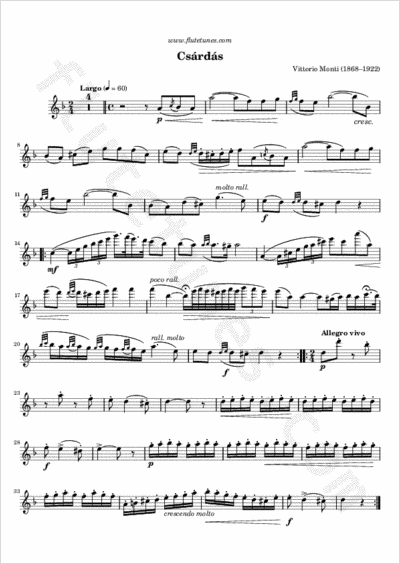 The flamboyant “Csárdás” was written in 1904 by Italian composer, violinist and conductor Vittorio Monti, and has since been a favorite among the elite violin virtuosos. Monti enjoyed great success with the Hungarian stylings of the work, which was originally composed for either violin or mandolin and piano. It has since been arranged for many types of ensembles, and for many listeners it captures the essence of the old Hungarian dance with its use of fast and slow music. The piece has seven different sections, each one of a different tempo. The tempo changes make the piece exciting and interesting, but even with all of these changes it is generally expected that there should be some rubato to add feeling to the piece.